"It's strange that a man can live with a woman for ten years and not know the first thing about her." Over the course of her 50-year career, Bette Davis worked (and battled) with some of Hollywood's finest directors�Joseph Mankiewicz, John Huston, Michael Curtiz, Frank Capra�but her favorite was undeniably William Wyler. A master craftsman with a firm resolve and iron will, Wyler wouldn't allow Davis to intimidate and bully him, as she did other directors. Instead, he dominated her, and his penchant for endless takes allowed him to shape and mold her portrayals. Although few directors could suppress Davis' trademark mannerisms, Wyler somehow reined her in, and under his tutelage she gave three of her most restrained, dimensional, and riveting performances. Their first collaboration (Jezebel) earned the actress her second Academy Award, while their last (The Little Foxes) nabbed Davis another Oscar nomination and remains a remarkable tour de force. Though the one in-between�The Letter�may not be as widely known, it stands as arguably their best work together. Adapted from a play by W. Somerset Maugham, The Letter takes place on a steamy rubber plantation near Singapore. The film opens in dramatic and startling fashion, as a gunshot disrupts the calm of a lazy tropical evening. A wounded man stumbles across a bungalow's veranda, followed by a woman wielding a revolver. She fires again and again and again, until she empties all of the chambers and the man lies motionless on the ground. Roused by the commotion, a throng of native workers rush to the house, where they find the woman staring blankly at the dead body, and still holding the smoking gun. The woman's name is Leslie Crosbie (Davis), and when her husband Robert (Herbert Marshall) arrives home with their attorney, Howard Joyce (James Stephenson), she confesses she shot family friend Jeff Hammond after the drunken man dropped in unexpectedly and tried to make love to her. Both Robert and Howard believe Leslie's story and agree she behaved admirably, but the law requires she be arrested and imprisoned until a jury clears her. Five days before the trial, however, an incriminating letter�written by Leslie to Hammond on the night of the murder�surfaces. In it, Leslie says she's desperate, and demands Hammond visit her that evening in her home; if he refuses, she writes, she "can't answer to the consequences." Hammond's Eurasian widow (Gale Sondergaard) holds the letter, and, through an intermediary, offers to sell it for $10,000. Howard knows he must obtain the damning evidence to secure Leslie's acquittal, even though buying it constitutes a federal offense. Leslie hopes acquiring the letter will not only save her neck, but also preserve her marriage by sparing Robert the devastating knowledge of her adulterous affair. From the opening frames, The Letter grabs our attention and never lets go, thanks to a brilliant screenplay by Howard Koch (Casablanca) and Wyler's impeccable shot compositions, which enhance the drama without distracting us from it. Although film noir hadn't yet evolved as a cinematic form, The Letter employs to great effect many of the visual and atmospheric hallmarks that would soon define the genre�deep shadows, stark contrast, and an air of impending doom. The tropical setting and native characters heighten the sense of unease, while Leslie's duplicitous nature adds complexity to the plot. Wyler also relies on his actors to create and sustain tension, and they comply with understated line-readings and subtle bits of stage business. Davis, of course, carries the film as the outwardly prim wife who suppresses her loneliness and sexual longings by stitching intricate lace patterns. She can't bear to hurt her sweet and generous husband, but can't stomach deceiving him either, and Davis masterfully depicts her turmoil. Marshall built a career playing sympathetic saps, and his anguished portrayal lends The Letter some much-needed heart, while Stephenson supplies the soul as the morally conflicted attorney who abandons his scruples and risks his career to save a woman he no longer respects. Stephenson's calm intensity seems to soothe Davis, who responds in kind, and the two share some hypnotic scenes. On his own, Stephenson is magnificent, and nearly walks off with the picture. Sadly, the actor would die the following year, just as he was achieving the recognition (and leading roles) he deserved. In a pivotal supporting part, Sondergaard is creepily electrifying as the vengeful Eurasian wife with "eyes like a cobra" and "a face like a mask." She only utters a few words (in Malay, no less! ), but her piercing gazes speak volumes, conveying heartbreak, anger, and revulsion. Sen Yung (best remembered as "Number Two Son" in more than two dozen Charlie Chan films) also makes an impression as Howard's oily, unctuous assistant. Davis recalls in her autobiography how she fought so bitterly with Wyler over her delivery of the film's climactic line that she stormed off the set�"something I had never done in my whole career." She eventually returned and recited the line Wyler's way, but the standoff proves yet again both artists were committed craftsmen who refused to compromise in critical situations. The fact that Davis acquiesced shows her respect for Wyler and implicit trust in his judgment. "I would have jumped into the Hudson River if he had told me to," she once wrote. Thankfully, he never made such a demand. The Letter garnered seven Academy Award nominations, including Best Picture, Actress, Director, and Supporting Actor (Stephenson). Whether it's classified as a precursor to film noir, a murder mystery, or a gritty drama of twisted passions is irrelevant. 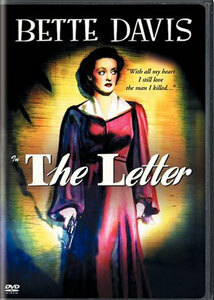 First and foremost, The Letter is a Wyler/Davis film, and that fact alone makes it a must-see. Image Transfer Review: The Letter benefits from an above-average transfer, which showcases the stunning contrast and brilliant lighting of Tony Gaudio's shadow-rich (and Oscar-nominated) cinematography. Blacks are lush and solid, and good gray level variance adds texture and depth to the film. Although grain is evident and some scenes appear a bit soft, clarity is often excellent (especially in close-ups). Mild speckling intrudes here and there, but the print possesses a bright, vibrant look that belies the movie's advanced age. Audio Transfer Review: An ever-so-faint hiss can be heard on the mono soundtrack, but all-in-all, Warner technicians have done an admirable job erasing any age-related defects. Pops and crackles are absent, and Howard Koch's all-important dialogue is always clear and comprehendible. The haunting, Oscar-nominated score by Max Steiner (one of his very best) sounds terrific, with wonderful fidelity and no distortion, even during the most melodramatic sequences. Extras Review: The most intriguing supplement by far is a recently discovered alternate ending. Considering all the hoops The Letter jumped through to clear the censors, I hoped the new ending would follow the path of Maugham's play more closely, but no such luck. In fact, it strays even further from the original work�and substantially softens dramatic impact�by deleting the climactic confrontation between Leslie and Robert. Still, the 10-minute sequence is a tremendous find, and includes a couple of extra snippets that didn't make the final cut. In addition to the film's original theatrical trailer (which features a couple of alternate takes), the disc also includes two radio adaptations of The Letter, both of which star Davis and Marshall, and both of which are produced by Lux Radio Theater. Host Cecil B. DeMille proudly proclaims on the first program (which aired on April 21, 1941) that Davis returned early from an Eastern vacation to participate in the production. The truncated adaptation faithfully follows the film, but Davis' performance does not. Free from Wyler's restraint, the actress injects far more histrionics and affectation into her portrayal. On a sad note, the 60-minute broadcast was recorded only three months before James Stephenson, who reprised his role as attorney Howard Joyce, died of a heart attack at age 52. The second program (which aired almost three years later on March 6, 1944) uses the exact same script as the first, and the performances of Davis and Marshall sound practically identical. Vincent Price (in his first Lux Radio Theater appearance) takes over Stephenson's role, and makes it his own. A triumph for director William Wyler, The Letter blends drama, passion, and intrigue as it chronicles a desperate woman's calculated plan to escape retribution. A bravura performance by Bette Davis (one of her finest) and impeccable support from Herbert Marshall, James Stephenson, and Gale Sondergaard make this sordid tale of deception and betrayal riveting from beginning to end. Warner honors Wyler's artistry with a satisfying transfer, above-average audio, and a couple of noteworthy extras. Highest recommendation.